It’s important to take care of your brakes with consistency maintenance. 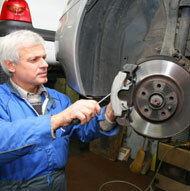 Your brakes are incredibly necessary to making sure that your vehicle is safe to operate on the road. If your brakes malfunction, it puts you and everyone else on the road at risk. The experienced technicians at Master Muffler in Clearfield can help you identify and fix any issues related with your vehicle’s brake system. Brakes use the kinetic energy of your vehicle into friction to make it slow down and stop. This is accomplished with two main types of brake systems in today’s vehicles, disc brakes and drum brakes. 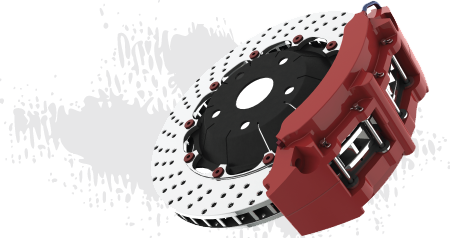 Disc brakes use brake pads that push into each other when you activate the brake system. The compression of disc brakes enables your car to stop and start smoothly. Drum brakes use a wheel cylinder and brake shoes to stop by pressuring the shoes against the drum of the cylinder to create friction, which stops your car. Grinding Noises: Grinding or screeching noises when you are braking means that the brake pads have started to wear away, and need to be replaced. Pedal and Wheel Vibrations: Your brakes may be out of alignment in some ways, and the first sign of this is if you feel shaking in the brake pedal or steering wheel when you try to stop. Burning Smells: Burning smells may be caused by a variety of things, but are commonly associated with brake problems, such as overheating. Pressure Loss: If your brake pedal isn’t actively resisting you when you stop, then something may be wrong with the master cylinder, which means that your brakes aren’t as reactive as they need to be. Brake Light Indicator: Some vehicles have a brake light indicator on the dashboard, which means the vehicle’s computer has found an issue within the brake system. If you or someone you know is in need of a brake check, or has an issue that they need resolved with their vehicles brake system, then don’t hesitate to stop by and give us a visit in Clearfield for an inspection. Our friendly technicians won’t stop until your vehicle is safe for you to continue navigating our beautiful Utah roads with!